OTTAWA - Proposed changes to Canada's elections law won't give Elections Canada new powers to address old unpaid leadership loans that the governing Conservatives have used repeatedly to bash both their political opponents and the elections watchdog. But the reforms should help eliminate the catch-22 that trapped some past leadership candidates in unrepayable debts. 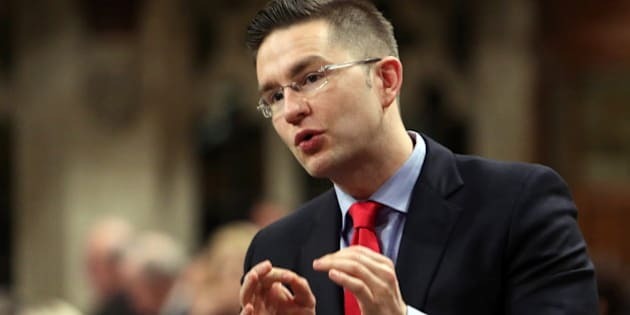 "The bill would keep big money from special interests out of the process by banning the use of loans — unpaid loans — to evade donation limits," Pierre Poilievre, the Conservative minister for democratic reform, said in the Commons this week. The legislation, once passed, would allow future leadership contenders to spend up to $25,000 of their own cash on the race, while allowing candidates in general elections to spend $5,000. It would also double the repayment period for loans to three years from 18 months, while restricting lenders to accredited financial institutions and political parties themselves, using market interest rates. Most importantly, leadership contestants would be allowed to continue soliciting funds from old donors in the years after a race ends. Currently, donors to leadership campaigns are held to a one-time lifetime limit of $1,200 — unlike contributors to parties and election candidates, who can give the limit year after year. The current rules mean that leadership candidates who find themselves in debt must continue drumming up entirely new supporters long after the race is over — a nearly impossible task, especially for losing bidders. Now, Poilievre is proposing to fix the fundraising problem — inoculating his Conservative party, while offering its opponents at least a fighting chance to clear up old loans with past supporters. While initially saying the act was not retroactive, Poilievre's office clarified the point late Friday. "While the new rules on loans and on unpaid claims are not retroactive, the change to the contribution limits for leadership contestants (per year rather than per contest) would apply to old debts that may still be in existence when the bill comes into force," Gabrielle Renaud-Mattey, Poilievre's spokeswoman, said in an email. What won't change are Elections Canada's powers to go after past deadbeats. "Elections Canada has the power under the existing act to investigate whether Liberal leadership candidates deliberately used unpaid loans to evade donation limits," Renaud-Mattey asserted. "It remains to be seen if such an investigation will proceed and it would not be impacted by the (new) Fair Elections Act." The government refuses to acknowledge that Yves Cote, the commissioner of elections, publicly stated last July that the existing law "lacks sufficient clarity to support enforcement action in the criminal courts." Backed by the director of public prosecutions — the very office in which the elections commissioner will reside under the new reform bill — Cote stated that "no enforcement action can be taken against the leadership contestants in relation to their unpaid debts." According to the NDP, two candidates from the party's 2012 leadership race — Brian Topp and Niki Ashton — still have outstanding debts more than 18 months after that contest. And at least three Liberal candidates from last April's leadership race were reported deep in debt last fall, although they've not yet passed the 18-month repayment deadline. Scott Simms, the Liberal critic on democratic reform, noted the Conservatives are fixing leadership financing problems only after the Liberals chose Justin Trudeau and the NDP elected Tom Mulcair in leadership races. "Timing is a funny thing," said Simms. "The next one, we know darn well, is going to be theirs." Poilievre has been the pointy end of the Conservative stick on the issue for years. He has needled Liberals, New Democrats and the impartial elections watchdog alike over the question of unresolved debts. As far back as May 2008, Poilievre was hounding then Liberal chief Stephane Dion about the arrears on his 2006 leadership debt. "The only escape is if Elections Canada steps in to protect the Liberal leader with preferential treatment and an extension," Poilievre told the Commons at the time. In October 2012, Poilievre used the debts to parry opposition questions about Peter Penashue, the Conservative cabinet minister whose cooked 2011 campaign finances eventually forced him to step down. Poilievre pointed to the unpaid leadership loans and called it "shameful" that the questioning Liberal had "the audacity to rise in the House and attack the integrity of one of the finest Labradorians and Canadians." As it happens, Penashue turns out to be one of seven Conservative candidates — along with cabinet minister Bal Gosal — who still had unpaid loans from the 2011 election campaign 18 months later, according to Elections Canada records. Since 2004, Elections Canada shows 128 candidates, including 35 Conservatives, had not repaid loans within the requisite 18 months after a general election. The government never speaks of these unpaid loans as being an issue. As recently as last June, shortly before he became the democratic reform minister, Poilievre defended MP Dean Del Mastro in the Commons by citing unpaid Liberal leadership debts. Del Mastro has since been charged with election expense offences from his 2008 Conservative campaign. Meanwhile, four Liberal candidates from the 2006 leadership race are still in debt, and Elections Canada has said it can neither grant them any more extensions nor can it prosecute them. Note to readers: This is a corrected story. In a previous version, the government indicated that rules on loan repayments would not be made retroactive.